Korey takes a closer look at the snowy owl, a creature who’s habits are hard to track because the live in remote, cold locations. The regal Snowy owls are strikingly white birds with males being predominately white with few dark spots around their bodies while females are white with darker barring throughout their bodies but not their faces. They are the largest North American owl with weight tipping the scales at three to six pounds due to the thick feathers they need for insulation from the Arctic cold. This makes them about twice as heavy as Great Gray Owl, which is the tallest owl in North America. They will show up in Wisconsin irregularly in winter to hunt on windswept fields or dunes as a pale shape with catlike yellow eyes. When looking at Snowy owl migration, it’s complex since some of the birds migrate south predictably and regularly, others will remain on the breeding grounds or even move north into the Arctic sea ice. 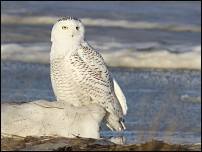 A phenomenon known as an irruption will happen occasionally where snowy owls will come flooding down from the north. Small irruptions happen on an average of every four or five years; once or twice in a lifetime, a mega-irruption will occur, when they show up much farther south and in greater numbers. The owl’s primary northern prey source, a small rodent known as a lemming, has had a temporary abundance which allows the snowy owl to be more successful in raising large clutches of eggs. The younger owls are the ones who disperse southward to avoid competition with the older birds for winter territories. Unfortunately, the population dynamics of lemmings and snowy owls are complex and poorly understood in large part due to the remote northern haunts they occupy most of the year.